If your kids (or your friends’ or family members’ kids) are like most, the playroom is where they spend a great deal of time. Most moms agree that it’s important to create a fun environment that’s also organized and conducive to creativity. That can be a tall order, especially if money and space are issues, so I’ve pulled together a few suggestions to help you design the ultimate rec retreat for your little ones! 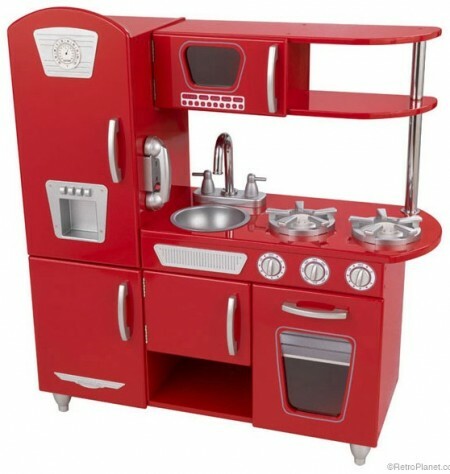 This retro kitchen playset includes cabinets and shelves, which can store all the toy pots, pans, utensils she needs, as well as fake food and food cartons. “A place for everything and everything in its place”, as the old saying goes, but it’s not always easy to pick up and organize when you’ve got young children! Stocking the playroom with shelves to the sky may be tempting, but it’s important to consider how high little hands can reach. Laundry baskets are great for storing toys and games, while peg boards and coat hooks mounted about three feet high are perfect for hangables like play clothes. Both solutions are also affordable, and leave you plenty of wall space to decorate in a motif of the kids’ choice. Equally important is basic organization. Keep like items together so your little ones will always know what goes where. This is where Command hooks and bins come into play, especially near playsets and play furniture. Of course, units with built-in storage are a plus. Keep things neat using storage bins or totes next to or behind dollhouses or other playsets that call for lots of accessories that get interchanged – like extra doll furniture and clothing. Storing similar items together makes cleanup a snap, and even the youngest child can learn where everything goes. 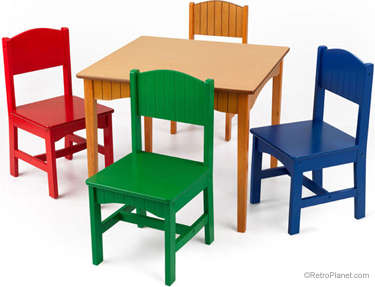 A sturdy table and chair set is perfect for crafting, pretend play and game playing. Every playroom needs a workspace where kids can get creative. Durable, kid-sized tables and chairs are ideal for crafts, board games and afternoon tea parties. For messy activities, cover furniture with an old tablecloth or shower curtain. Detailed playsets are perfect for engaging the imagination and often come with several accessories. Most are designed for floor or tabletop use (which makes for easy fun when multiple kids are around). Popular themes are fire and rescue, fire station, construction and garage. When it comes to outfitting a playroom, the only limit is your imagination. I hope that some of these tips have you well on your way to creating a fun space your children will love! Do you already have a playroom in your home or are you in the process of building one? How are you going to decorate it? Have your kids made any special requests?